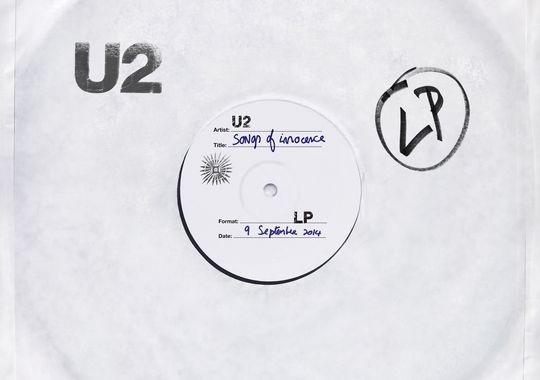 Album Review: U2, Songs of Innocence – music waffle. Well, well, well. A FREE album from one of the music industry’s most senior bands. I’m as partial to a freebie as anyone, as long as it’s a mini tube of toothpaste at the dentist, a Murray mint at the restaurant till or a one off music track. But I’ve got to admit that giving a whole album away makes me feel a little uncomfortable. With so many artists struggling for decent sales figures in the current market and having to supplement their revenue streams from other sources, it seems to demean music as a commodity even further. And I don’t really believe the proffered explanation that it’s to entice new fans because after 12 albums, they’ve got tons of them. Shed loads. And anyway, what’s new to find out about this band? As it happens, quite a bit, as the band have taken the best part of five years to look back to their early influences and formative experiences as their inspiration for this album. The album kicks off strongly with some Oh-ohs and a chopstick clattering beat for The Miracle (Of Joey Ramone), which is a belter in the classic U2 mould and clearly cites an early musical hero. I particularly like the verse “We’ve got language so we can’t communicate, Religion so I can love and hate, Music so I can exaggerate my pain and give it a name.” Ah yes, those self indulgences of the song writer. After some initially less grabby tracks (which actually grow hugely after a few listens, especially Song for Someone, produced by all conquering Ryan Tedder of One Republic) we head into a strong section with upbeat Volcano, followed by Raised By Wolves, which has a fabulous huff-and-puff-and-blow-your-house-down effect on it, and a striking interjecting guitar jangle. Written from the perspective of a youth mired in the terrorism rife during the band’s youth, it’s a tight track, very evocative lyrically – “Face down on a pillow of shame, with some girls with a needle trying to spell my name, my body’s not a canvas, my body is a toilet wall”. Bono’s allusion to tattoo vandalism reflecting the blight of the troubles on society’s skin. Cedarwood Road, where Bono grew up, has a big rock climax, with the plaintive wail of “a heart that is broken is a heart that is open”. Sleep Like A Baby Tonight has the album’s most uncomfortable moment, when Bono’s voice goes into falsetto, which sounds like a bit of a stretch, but it’s balanced out by a rather nice guitar solo, and if I’m honest I could do with a bit more “Edgy-ness” throughout. This Is Where You Can Reach Me Now leaves me unable to stop singing “Soldier soldier” repeatedly. Grrr! It’s reminding me of that TV progamme with Robson and Jerome. It would be a shame if the manner of introduction to this album put people off giving it an open ear. If junk mail arrives through your door (or iTunes account) the temptation is to bin it immediately, with a sense of intrusion. As the lyrics say, “Every gambler knows that to lose is what you’re really there for.” I’m pretty sure they went into this strategy knowing they would get panned by many people, but the payback could be huge. And this may be a case of getting down off your high (gift) horse and not looking it in the mouth.